Earmold Australia® Pty Ltd is a company committed to the supply of quality products for hearing protection, occupational health and safety, communication and the motor sports industry. The company was founded 1984 and formed in 1988 with the current owners after being agents themselves since 1996 Aaron & Julie Dalle-Molle purchasing the company in 2011 represent EARinc, Insta-Mold, Cens Digital & Puretone with a unique range of custom hearing protection and associated hearing healthcare products. We are also distributors for Sena Bluetooth and Baehr intercom systems. We have an extensive range of products ideal for a multitude of situations for Industrial work environment, Motorcyle riders, Motor sports, Security communications, Swimming, Surfing, Water sports, Sleeping, Relaxation, travelling, Medical etc. We offer the only medical grade custom made silicone earplugs that are made on the spot by us or any of our accredited agents that meet the Australian Standards as a Class 5 hearing protector along with our own Laboratory made earplugs. We have fitting technicians & Audiology clinics throughout Australia, New Zealand & Singapore that will come to your home or place of business where possible to manufacture the earplugs onsite. 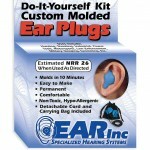 In Addition to the regular silicone earplugs we also carry a wide range of electronic plugs and connectors for radios in recreational, industry and security uses. Along with a great range of other hearing related products including Motorcycle communications and healthcare products include RingStop. Earmold Australia and its many agents are not franchised, our agents and companies that we supply are stand alone businesses that purchase products that we produce or source through us. We supply Hearing & Safety companies, Audiologists, Medical clinics, Motorcycle shops, home businesses and large corporations. If you would like information on becoming an agent for Earmold Australia or our related products please contact us directly for more information.